Praise dance in the U.S. frequently employs ballet and interpretive dance with a lot of additional arm movements. By learning a few simple moves, you'll be able to create your own praise dance choreography. There aren't very many designated "steps" in praise dancing, as it is all open to interpretation and personal expression before God, but you will sometimes see routines infused with more mainstream moves, taken from genres like ballet or jazz. Traditionally, the arms are often raised up toward the sky, or in front of the body as if reaching out to God. The arms can also be held out to the sides to symbolize Christ, surrender to God, or openness to healing and restoration. The following steps are often incorporated into praise dance. The bow can be done from a standing or a kneeling position. While standing, bend at the waist and lower your head toward your knees. At the same time, spread your arms out to the sides. 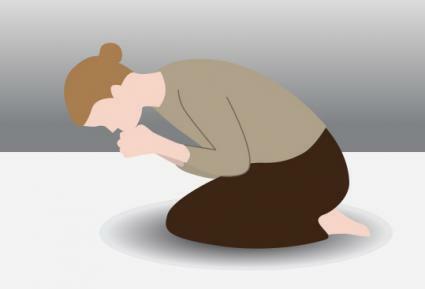 Kneel with both knees on the floor. Bend over, and bow your head while placing your hands on your knees or the floor. As an alternative, to add some dramatic flair, you can clasp your hands as if in prayer. This step works beautifully to move praise dancers around a circle. Stand with your feet approximately shoulder's width apart. Step with your left foot, placing it behind the right. Move your right foot to the right, so that your feet are shoulder's width apart again. Step with your left foot, placing it in front of the right. Move your right foot to the right, so that your feet are back in their original position. Repeat steps 2 through 5 to keep moving in the same direction. Pivot clockwise on your right foot until you're facing the opposite direction. Pivot on your left foot, continuing the clockwise turn, until you end up facing the same direction in which you started. You can continue to do three-point turns while moving across the floor in one direction, or switch feet and pivot counterclockwise to go the other way. An arabesque is recognizable as a ballet step. The position can be challenging but you can easily adapt it to the level of your ability, since this dance is about praising God, not demonstrating perfect technique. Step forward on your right foot. Lift your left leg behind you as high as it can go, raising your arms at the same time so that they are roughly parallel to the floor. Be sure to rotate your leg slightly outward as you raise it. This will reduce the pressure on your back. Hold the pose for a few seconds. 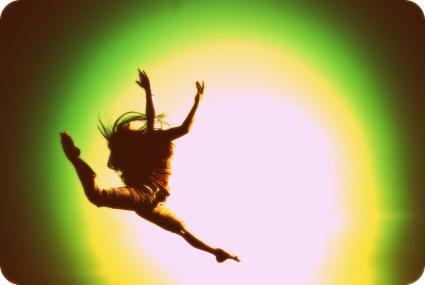 A leap can be used in a praise dance to express joy. There are different styles of leaps. A popular one is the grande jete or split leap. Take several running steps, enough to give your leap momentum. Leap into the air using your arms to gain some height, and do a split with one foot in front and the other behind. If you can't do a full split that's okay, do the best you can. Land with slightly bent knees, not straight legs. That will help absorb some of the shock and protect your knees. The following video shows praise dancers using many of the above steps including lots of grapevines and turns, and the dance ends with a bow. It also provides a good example of the arm movements typically used in American praise dance. Praise dance is a powerful ministry tool. If you're interested in exploring this dance form further, watching praise dance videos can help you view steps and try them on your own. There are also many Christian dance conferences and workshops throughout the United States and internationally, such as the International Christian Dance Fellowship, which you can attend. Whatever you choose to do, remember that praise dance is about personal expression, and your ability to express joy and reverence through dance.